A poster that van Essche designed at the age of 20 has been selected as the affiche for an exhibition at the Delmar gallery in Sydney, Australia, from February 4th to 25th 2018. The exhibition will focus on Dada ephemera, Neo-Plasticist works on paper and Dada-inspired artists’ books drawn from the private collection of Sydney-based curator, Akky van Ogtrop. 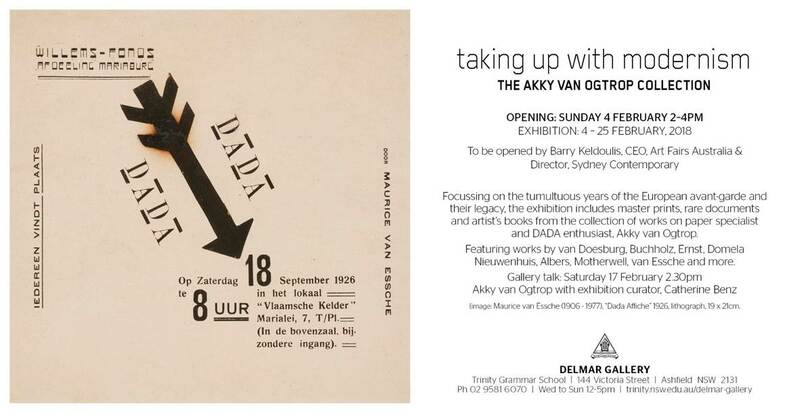 Akky’s passions are Dada and works on paper, and since migrating to Australia she has presented research on Dutch Dada and championed printmaking, notably establishing the Sydney Art on Paper Fair and leading the Print Council. The art collection she has built up over four decades is unique in Australia, and it will be a rare chance for students and the general public to see master prints and graphics by artists such as Maurice van Essche, Erich Buchholz, Theo van Doesburg/Kurt Schwitters, Lajos Kassak, Cesar Domela Nieuwenhuis and many more.